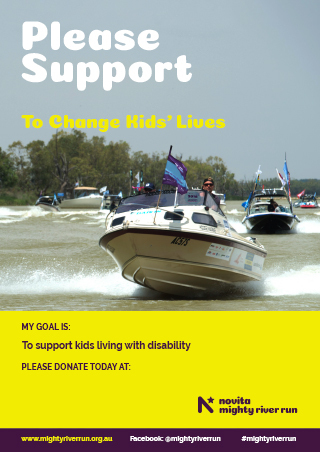 By taking part in this event, you are helping to make a difference to kids living with disability and their families. 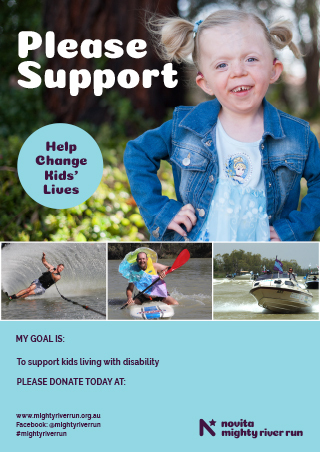 This iconic South Australian event has a rich history with support from yourself, and others like you in the community, helping to make an incredible difference to thousands of Novita families. The first thing you need to decide with your crew is if you are going to aim for the minimum fundraising amount of $6,000, aim for a little higher, or completely smash your fundraising target! Let’s be honest, everyone wants the title of the highest fundraising crew on the run and fly the title’s flag all week! Add a picture to your page and add a message in the ‘My Story Section’. Let everyone know why you and your crew got involved with the Mighty River Run and why Novita is a cause you want to support. Show your commitment and get the ball rolling by making a donation to your own online fundraising page. The higher the first donation, the higher the average amount so donate $50, $100, the sky’s the limit, to set the standard for following donations. Email is a great way to ask family, friends and colleagues for support as you know they will see it and read it. Send an email to your network and tell them what you are doing, why you are doing it and ask for their support to reach your goal. Facebook and Instagram are the best platforms for sharing your story and asking your friends and followers for their support. Post weekly updates on your social media pages to share your progress, how far you are from your goal and of course, when you’ve reached it! 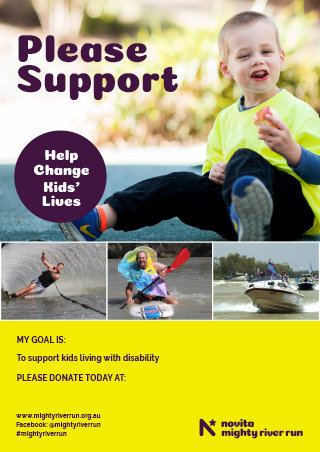 We have a range of posters and resources for you to use to help you spread the word about your goal of supporting kids living with disability. Trivia night at your local pub – Ask your local pub if they will let you use their venue for the night and get your mates to help spread the word. Get everyone to donate $10 to be part of the trivia quiz. You could also have a raffle for some bonus fundraising! Morning tea/BBQ at work – Ask everyone to bring a donation for an “entry fee”. Go one further and hold a bake-off where everyone brings in their baked goods and it’s a gold coin donation to vote for the yummiest snack. The winner is whoever gets the most donations. Lunch or dinner event – You can hold it at a local hall, community centre, your backyard or a restaurant. You can ask local businesses to donate goods and services for a raffle and/or auction. Golf Day – Get your family, your mates, your mate’s mates and colleagues together for a day on the green for a good cause. Talk to your local golf course about charity golf day options. Film night – Have a chat to your local cinema about holding a film fundraiser. You can get a percentage of ticket sales, hold a raffle and get donations on the day. Update your picture with a picture of your crew from a previous event or social gathering so people know who they are donating too. Also include a message on why you got involved with the Mighty River Run and keep posting updates on your fundraising activities. Share your page regularly on Facebook to let your friends and family know what you are doing and why. Also, don’t be afraid to ask people to share your page too! 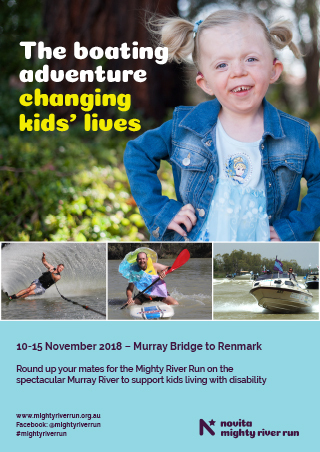 "This November, I am joining the Mighty River Run flotilla on the spectacular Murray River to fundraise for Novita and support kids living with disability in South Australia. Please donate to my crew and help us reach our goal!" Personally email your family and friends and include a link to your online fundraising page. No one is off-limits so try and send it to as many people as you can to raise even more funds! Don’t be scared to send reminder emails either as sometimes people do genuinely just forget. If you reach your fundraising goal before the event, don’t stop fundraising, increase your goal! Ask your boss to dollar match what you raise. There’s no better way to double your impact and many businesses have a Corporate and Social Responsibility Policy as standard practice these days. Sausage Sizzle - Bunnings BBQ dates are often booked well in advance, therefore it is advisable to contact your local Bunnings ASAP. Some Woolworths or local shopping centres also allow this. 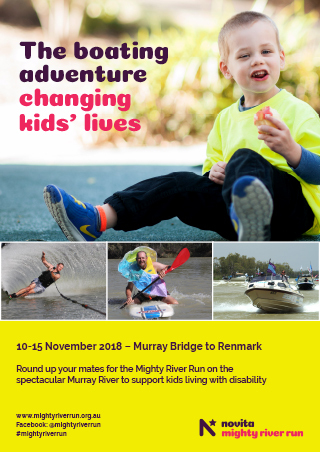 Novita has Mighty River Run donation boxes that you are welcome to utilise over the course of your fundraising. These boxes can be placed at: your workplace reception or lunch room, your local supermarket, butcher, fruit n veg shop etc, your coffee shop, the pub, or at your kid’s school or child care centre. You will be surprised how quickly small change can add up! Trash ‘n’ Treasure sale - that old saying, someone trash is someone else’s treasure! Take on a challenge - keep growing that beard until the run, time to start that weight loss goal, time to wax the chest? Or pledge to shave your head once the run is completed? People will pay to see you embarrass yourself! There are three ways for you to bank your offline donations. Any donation received through the mail or bank deposit can be added to your online page. 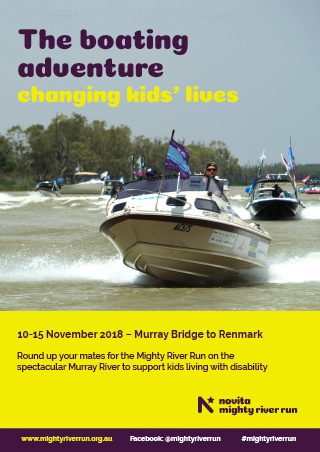 We strongly support awareness created by your activities relating to the 2019 Mighty River Run. However, we do ask that for all media enquiries, you liaise with Novita, or ask the media to correspond first through Novita.